When attacking 1/2 slide protection often the first step is to determine where is the offensive line sliding? The placement of a 3 technique often has a large impact on where the offense chooses to slide. If an offense chooses to slide away from a 3 technique the following problem is created. The slide is going to the defensive left. The first uncovered offensive lineman will start the slide going from defensive right to left. With the RT, RG, and C covered the first uncovered is the LG. That means the C, RG, & RT are all man scheme. In the picture IF the C slides the Nose is unblocked in the weakside A gap and IF he blocks his man responsiblity(NOSE) the LILB is unblocked blitzing the A gap. The RB is dual reading away from the slide and therefore isn't looking at the blitzing LB. This is especially effective if the LOLB is blitzing because there is no way the for the LG to help with the A gap blitzer. The LOLB can also fake the blitz to hold the LG giving the LILB a run through while bringing only 5. This breakdown has lead many half slide teams to check the slide to always be sliding to the 3 tech. A second solution is to turn the 1/2 slide into a full slide which I will address in a later post. When dealing with a team that checks their protection based on the 3 technique an effecive strategy is to get a 2 on 1 vs the running back. Since the RB will go opposite the slide the RB will also go opposite the 3 technique. 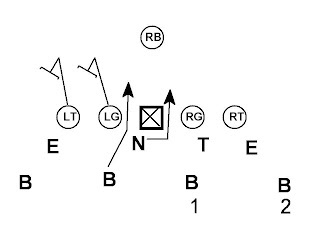 The following is using the NCAA zone blitz vs half slide to create the 2 on 1 vs the RB. In this example the LT is man on the DE who is long sticking. The LT doesn't know that the DE will eventually go all the way down to the A gap which should be the LG's responsibility. The LT only knows that he has the DE man and must block him on an inside movement. The inside blitzer is aiming for the B gap which will disappear as the LT chases the DE inside creating a 2 off the edge blitz. This leaves the RB with 2 people to block. The QB should throw hot in this situation. Unfortunately for him he is throwing directly at an inverting Safety in the 3 under 3 deep coverage. 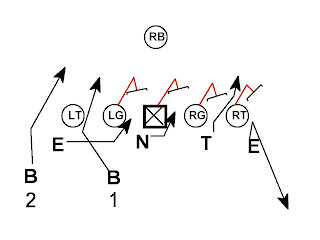 This blitz can be brought from the 2 receiver side as many do but it can really be brought from anywhere. Vs. a right handed QB this blitz can be brought from the defensive left to make sure the QB has the blitz in his field of vision and is forced to throw hot or be sacked in a long yardage situation. Or brought from his blind side (defensive right) to create unseen pressure.